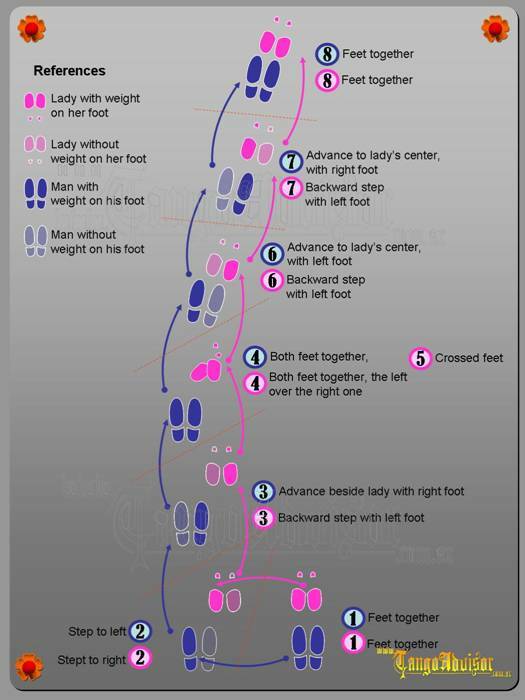 First of all, but only for fill your "crazy wishes" (ganitas locas) of dance Tango, here is the sketch of the eight basic Tango steps. It's a universal statement that if you can do this eight steps you can dance Tango. MOREOVER, we show you in this video, our best Tango Teachers dancing a whole Tango with only the eight steps, but the "trick" is that they are using something else: The Feelling, The Conection. Now that you have seen them, allow Tango Advisor® to tell you that is absolutelly unnecessary that you memorize, print and then do infinit efforts to repeat them mechanically. We ask you to forget for a moment about this steps and that first understand and live that the Tango essence is in the Hug, in the conection, far away the chauvinist methaphores existing arround Tango. The only and real imperative of Tango, is to connect with the other, to give him/her their times, is an asking and waiting for an answer, for then, and only then, to dance. The Man proposes, asks, and the Lady answers, only then they move, and when this silent dialogue appears, is easy to dance, and look from outside, it's easy to see. Tango is danced because it is felt, the sensation of Tango is the most far from technique, is to flow invaded by music. This is reached trough feelling the other and the melody, and then, flow-dance.